Australian Plants Society NSW - Kunzea "Badja Carpet"
Kunzea “Badja Carpet” is a mounded ground cover with a spread of several metres. The dark green leaves are small and aromatic. New stems are dark red. Small clusters of white flowers are carried on the ends of branches. Early summer is the main flowering period when plants become covered in blooms. Tip pruning will improve foliage density and increase flowering. “Badja Carpet” could be grown on embankments or trailing over walls. K. “Badja Carpet” is probably a form of K. badjaensis, a species named in 2016. 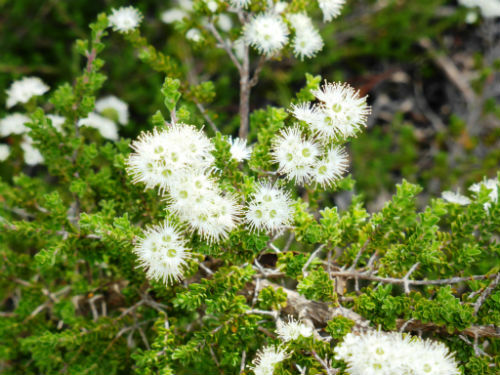 “Badja Carpet” is found on Big Badja Hill in Deua National Park, southern NSW. Propagate from cuttings that readily produce roots.